According to reports, which likely stem from White House leaks, Barack Obama is considering former Republican Senator Chuck Hagel for Secretary of Defense. The White House has probably not made up its mind and is using the leaks to gauge the opposition. If that’s the case, then the strategy is working as intended. The stories of Hagel’s looming nomination have aroused intense opposition--but almost exclusively from individuals and organizations that back Israel’s right-wing government and find Hagel’s views on Israel repellent. I know something about Hagel. I spent several months talking to him and to people who know him for a profile I wrote for The New Republic in 2007 when he was considering running for president. 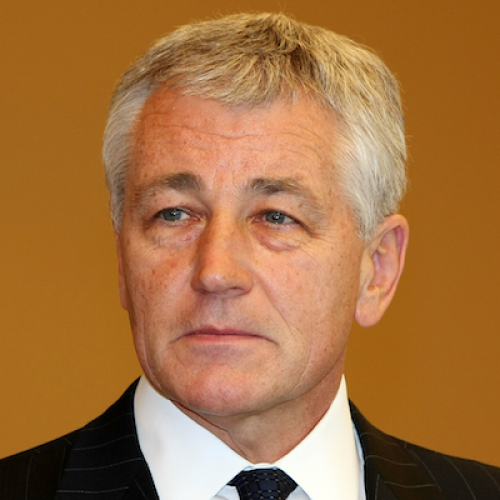 I can’t confidently say that he would make a good or great Secretary of Defense, but I can say with confidence that Hagel is a honorable man who served with distinction as a senator and that his foreign policy views, including his positions on Israel and its American lobby, are, if anything, a reason to support rather than oppose his nomination. Elected to the Senate from Nebraska in 1996, Hagel styled himself a Reagan conservative. He ran in on a platform of tax cuts, but he was really closer to an “old guard” Midwestern Republican. He was not knee-jerk anti-government, especially when it came to farm programs. He was anti-abortion because he had to be in order to get elected in Nebraska. His opposition to the Kyoto global warming treaty was also in line with Nebraska’s farm interests who feared it would raise petroleum prices. On foreign policy, though, Hagel was his own man. He became interested in foreign policy after returning from Vietnam where he had served as an infantryman and had been twice wounded. He returned to finish college, where he read widely on the subject, and harbored doubts about American intervention, that would burst forth later. Once elected to the Senate, Hagel asked for a seat on the Foreign Policy Committee, which was thought to be a backwater under Sen. Jesse Helms. As casualties mounted in Iraq, Hagel became an outright opponent of the war. He saw Bush making the same mistakes in Iraq that Lyndon Johnson had made in Vietnam – attempting to achieve a phantom victory by escalation. Always outspoken, Hagel hinted in 2007 that Bush should be impeached. These words spelled the end of Hagel’s presidential aspirations in the Republican party. In June 2007, Hagel announced that he was retiring from the Senate. Out of office, Hagel taught foreign policy at Georgetown, served on the President’s Intelligence Advisory Board, and chaired the Atlantic Council, a headquarters for Washington internationalism. In Washington today, Hagel’s views are mostly associated with those of Brent Scowcroft and Zbigniew Brzezinski. Hagel calls himself a “principled realist.” He remains skeptical of American attempts to foster democracy through unilateral intervention. He calls for the United States to create a “new world order” by reforming and reshaping international organizations to take account of the rise of countries like China, India, and Brazil. He wants the United States to understand the limits of its power to unilaterally effect events, whether in Syria or Iran. He backed the Obama administration’s decisions to leave Iraq and to withdraw from Afghanistan in 2014. He has energetically backed the “peace process” and a two-state solution in Israel and Palestine. In 2009, Hagel was one of eight notables to sign a report to Obama recommending that the United States shift “its objective from ousting Hamas to modifying its behavior.” The U.S. should “offer it inducements that will enable its more moderate elements to prevail, and cease discouraging third parties from engaging with Hamas in ways that might help clarify the movement’s views and test its behavior.” Hagel and the other signatories (including Brzezinski, Scowcroft, Lee Hamilton, Carla Hills, and Paul Volcker) also called for the U.S. to encourage rather than block “Palestinian national reconciliation” between Hamas and Fatah as long as Hamas was willing to accept President Mahmoud Abbas’s role as “chief negotiator” with Israel. There are, of course, liberals and conservatives, Democrats and Republicans who would disagree with Hagel’s stands on these issues. But these are not reason to block someone from being Secretary of Defense. For starters, Hagel would not be in charge of America’s diplomacy--that job falls to the Secretary of State. Beyond that, Hagel has the right approach. When America has refused to talk to adversaries, or to adversaries of its allies, it has courted disaster. That was certainly the case with the American decision not to recognize China after the Chinese revolution. If the United States had had relations with China in 1950, the Korean War might not have occurred, or might have been much shorter. America had to break relations with Iran after the hostage crisis in 1979, but two decades later, the United States was ignoring overtures from Iran that could have eased tensions. Similarly, if the United States had not appeased Israel in 1975 by refusing to talk to the PLO, the U.S. might have been in a position to bring the PLO into Camp David in 1978 and to cut short the war in Lebanon in 1982. On the other side, the United States’ willingness to maintain diplomatic relations with the Soviet Union during the Cold War may have prevented World War III. Hagel may have been too optimistic about the results of such diplomacy, but he was right about the dangers of avoiding diplomacy altogether. The rightwing Republican case against Hagel doesn’t stop there. His opponents have repeatedly cited what Hagel told former peace negotiator Aaron David Miller, which Miller quoted in his 2008 book, The Much Too Promised Land. Citing AIPAC’s clout, Hagel told Miller, “The Jewish lobby intimidates a lot of people up here.” The Republican Jewish Coalition saw Hagel’s statement as evidence of a “visceral sentiment” against Jews and Israel. Another critic called it an “anti-Semitic meme.” But referring to AIPAC as a Jewish organization is about as scandalous as referring to the NAACP as an African-American organization; and any reporter who has covered foreign policy on Capitol Hill learns very quickly that Senators and House members have taken positions on Middle East issues not out of conviction, but out of fear of retaliation from AIPAC. The attempt by the Republican Jewish Coalition and The Weekly Standard, which still holds a special grudge against Hagel for opposing the Iraq war, may not succeed in derailing Hagel’s nomination. AIPAC has been quiet to date on Hagel’s potential nomination, and J Street, its liberal counterpart, has actively backed Hagel, who spoke at its 2009 conference. So has Aaron David Miller. One key indicator of Hagel’s chances at confirmation will be whether John McCain speaks out in his favor. The two men used to be very friendly –Hagel was the co-chair of McCain’s presidential campaign during 2000 – but fell out over the Iraq war. If McCain backs Hagel, then Obama may be willing to risk the controversy that the pro-Netanyahu groups are likely to foment. But if the Republicans coalesce against Hagel, as they did against Susan Rice, Obama may worry that the nomination fight will overshadow his efforts to evade the fiscal cliff. Hagel should not get a pass because he is a Republican who backed Obama, or was a wounded Vietnam vet, or has views on foreign policy that are close to Obama’s. There is the overriding question of whether he can run the Defense Department. Former Rep. Les Aspin was second to no one in his grasp of defense budget intricacies, but he failed as Secretary of Defense because he lost control of the bureaucracy and couldn’t deal with the inter-service rivalries. The same could happen to Hagel who would come to the job without the administrative background that Leon Panetta, Robert Gates, or William Perry brought. But it would be a travesty if Hagel were turned down for the job because he had voiced views on Israel and AIPAC that are widely held in Washington, but infrequently expressed.